The John J. Burns Library of Rare Books and Special Collections is located on the North side of the Bapst building facing Commonwealth Avenue. Acting as a “bookbuilder” brings to mind, for me, an attempt to understand the fundamentals of book publishing – the building blocks of a physical book, albeit – that form the timeless basis for the industry today. Undergoing this internship at a special collections library such as the Burns, I had the invaluable opportunity to study the origins of book publishing among incredibly historical texts. As one of my side projects, the Conservator of the Burns, Barbara Adams Hebard, chose a book each for my colleague Jen and me to study and research. Seeking to break down their various components, we set about learning how books were physically, and meaningfully, published. Bookbuilder Interns studied these two books from the Burns Library’s collections. The book featured in this post, Appendix Ad Grammaticum Proteum de Alphonsi de Vargas, is pictured above on the right, BX3706.F67 1636 Jesuitica. Photograph by Gary Gilbert. In the Conservation Lab, Barbara gave us a diagram of the typical book, which we then applied to our own books that we had been commissioned to study. In my observations, I noted some key differences that exist when it comes to my rare, old book, which is called Appendix Ad Grammaticum Proteum de Alphonsi de Vargas, written by Laurent Forer. An obvious observation is that Appendix is not a hardcover book but a “paperback” of sorts; yet, it is not really a paperback at all, as the cover is actually made of vellum (which is the skin of an animal stretched thin). Specifically, it is what’s called “limp vellum” binding, without boards; limp vellum bindings, I learned, were often used in order to be economical when it came to bookbinding. My book was bound (or perhaps even rebound) sometime in its history (probably in the 19th century) with a leaf of an illuminated manuscript, likely from the late medieval centuries. It runs horizontal from the front cover over the spine and onto the back cover. 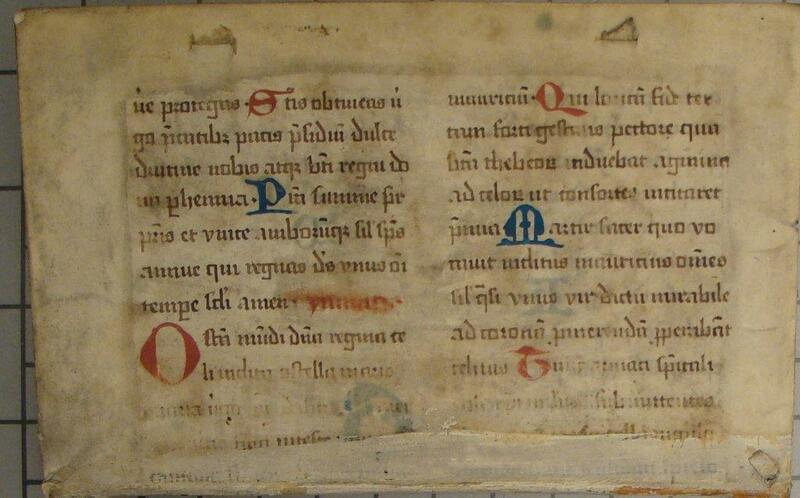 Its illustrations are blue and red, with some lines of the script written in all red instead of black on the back; this fact probably relays that this leaf is from a liturgical work, since that red phrase would have denoted a priest’s words in a liturgy. Despite its unusual cover, the book has most of the other trappings of a traditional book, such as a hinge, a back cover, a square, a doublure margin, a headband, an inner joint, and a first flyleaf. It also has the top edge, head, fore edge, tail, foot, and spine. Front cover: close-up of vellum showing hand-written text. Physically, this book has some other really interesting features as well, besides the fact that its cover comes from a completely different century than the content of the book, which dates to 1636. 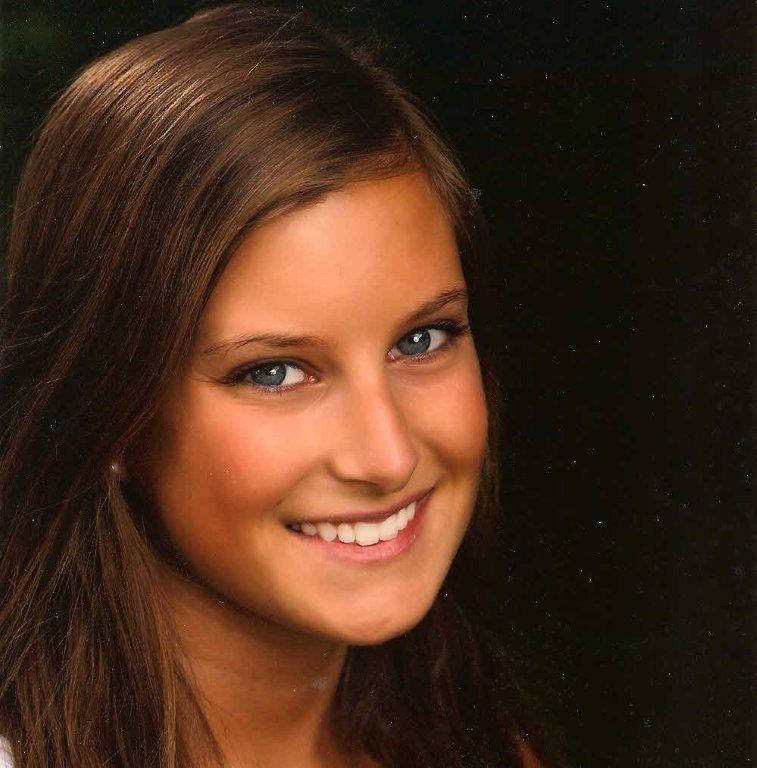 The fibers of the headband are woven out of two different colors of silk – white and blue – and its threads are so small and worn that Barbara was the only one who could detect that. I noticed four strings, about two millimeters in width, which seemed to come from the spine of the book and then pull through underneath the cover of the book. 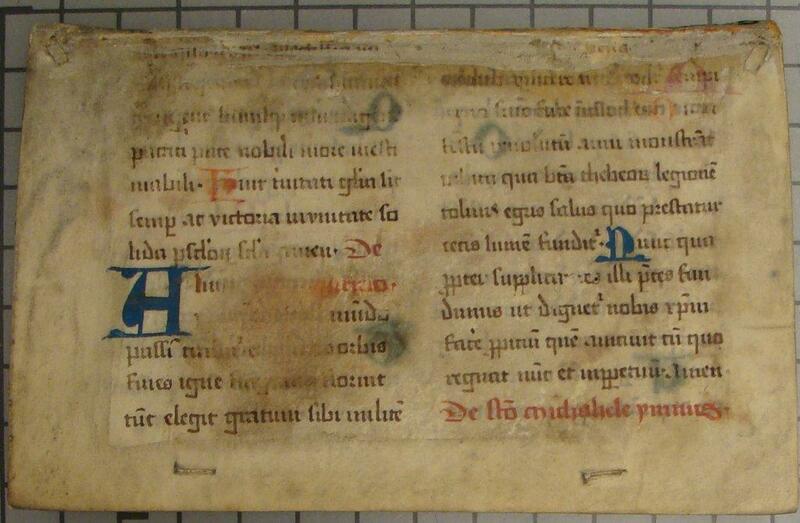 These straps, Barbara noted, are made of vellum; I guessed that they were likely threaded through in order to enhance the strength of the book and make it flat, and also to attach the text block to the cover. From further reading and research, I learned that these straps are actually called slips, which hold the cover in place by being threaded through the vellum through slits. I noticed two more sets of vellum slips on each the front and back cover of the book, that appear to have been cut short at their exit point from underneath the cover. 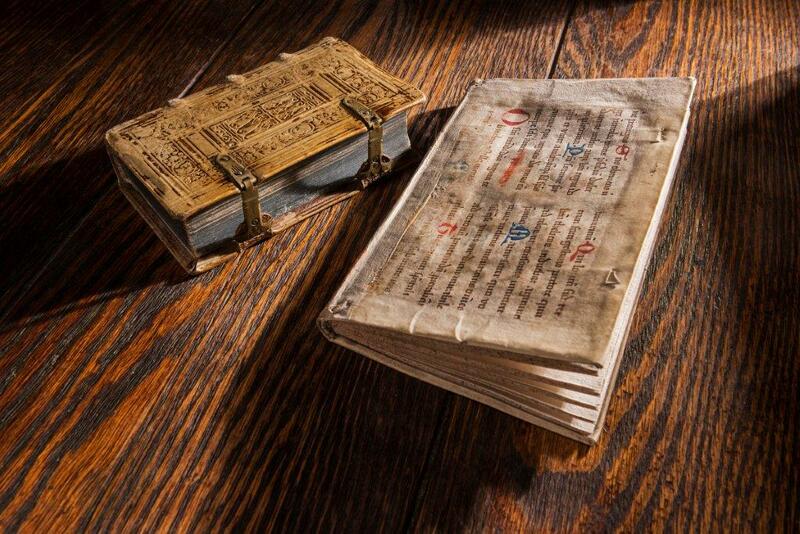 The straps from these particular points probably were used as ties to close the book, rather than metal clasps. Someone later on may have cut them off, likely because they were either too worn down from being tied so much or the owner of the book got fed up with tying the book so often. The pastedown of the Burns’ copy of Forer’s book is really a mystery; on both the front and back, it is a handwritten sheet of music and lyrics, pasted face down. Alas, not only was the cover recycled in the book’s rebinding, but so are the pastedowns, which seem to be jotted-on scrap paper of no connection to the text. Sure enough, as I browsed Michelle P. Brown’s book Understanding Medieval Manuscripts: A Guide to Technical Terms, I learned that “pastedowns are often formed of fragments of earlier manuscripts that were considered dispensable.” This book has many layers of reuse, which is why Barbara chose it for me; as I am an Environmental Studies minor, Barbara believed I would find this fact charming (which I do). 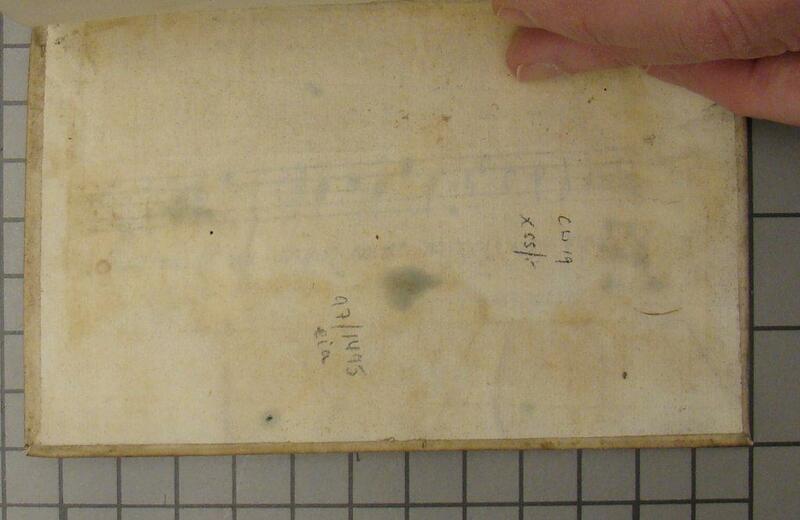 Detail of the pastedown, with faintly visible musical notation. Back cover: close-up of vellum showing rubricated text in the lower right corner. On Monday, March 18th, the other Bookbuilder of Boston intern Jen O’Brien and I finally had the exciting and rare opportunity to visit the Clean Room, which is a physics and forensics lab located on Newton Campus, just a short bus ride away from the Burns. Along with us I brought pigment samples from the cover of my and Jen’s book. Our goal was to have the pigments tested by a physicist, Dr. Gregory McMahon, in order to figure out just what that pigment on the cover is; by knowing this, it is easier to further understand from which time period the illuminated manuscript came, as certain pigments were used by scribes at different times throughout history. To do this, Barbara used a tool to chip a miniscule amount off of each of our book’s covers to be tested in the lab. To give an idea of the size, 50-70 microns is the width of a strand of hair, and my sample is 1/5 that size. My pigment came from one of the illuminated letters of the manuscript, which has both red and blue pigments on the front, but in this case it was the red pigment. Armed with these samples, Jen and I arrived at the Clean Room to be suited up. We had to wear full hazmat-like suits in the lab not because the materials we were working with were harmful, but instead because we – our skin cells and our hair follicles and the dust particles from our clothes – could harm the samples and taint the results. Once we were head to toe in crinkly white stuff, we headed in to watch Dr. McMahon begin. Our goal in bringing these pigments to the lab was to expose them to a Scanning Electron Microscope (SEM) in order to decipher what elements comprise each pigment. The SEM is no simple tool; it is a huge machine connected to several computers. The SEM operates inside a vacuum, with a pressure that is similar to deep space; the sample is placed on carbon conductor tape and bombarded with electrons from a beam, the resulting energy being measured as an X-ray and graphed on the computer. Based on the frequency measurement of the electrons bouncing off the sample, the element or elements of the pigment can be discovered. When my pigment was tested, the data on the computer’s graph spiked at a frequency that reflected the elemental composition of mercury and sulfur. Next, using an online search engine affiliated with the Museum of Fine Arts called Cameo, we were able to plug in these elements and match the substance with a “bright red pigment” called vermillion. Vermillion was made from cinnabar, a mineral from China, available in Europe through eastern trade routes. 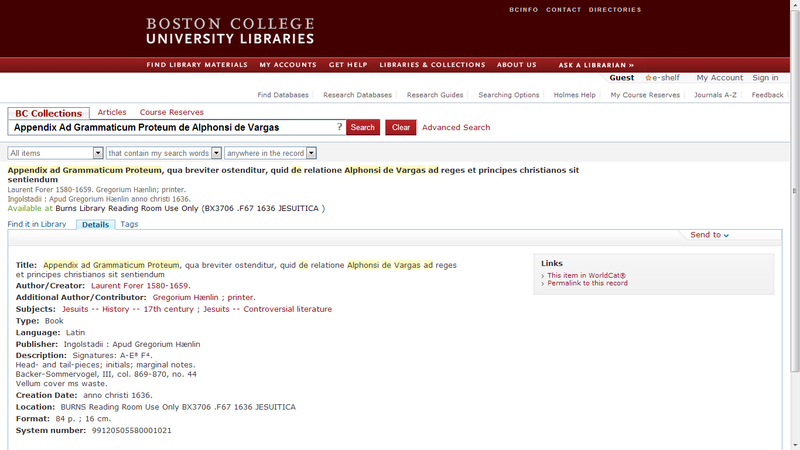 The BC Libraries catalog record for Appendix Ad Grammaticum Proteum de Alphonsi de Vargas, written by Laurent Forer. While working with Barbara to decipher the physical extent of my book, I have been simultaneously working with the Burns’ cataloguer, David Richtmyer, to begin to crack its literary extent. Discovering that the pigment used on the cover was vermillion, I had confirmation that the manuscript was from medieval times, likely around the year 1450. But what about the text itself? In analyzing the title page and subsequent features of the printed text with David, as well as cataloging my book with the MARC record used by the Library of Congress, I was able to discover certain details to bring the content of my book into greater context. I already knew Forer’s book belonged to the Jesuitica collection here at the Burns, which contains an impressive amount of historical materials. Gleaning what I could from David’s knowledge of printed materials and also the Latin language, I discovered the Burns’ copy of Forer’s work is likely an abbreviated version of a longer book on Catholic Jesuit theology – a pocket-sized version if you will. In the 17th century, church and state were not yet separate, and this book is a Jesuit point of view on politics, and a sort of counterattack on behalf of the Jesuits. The man whose name appears in the title – Alphonsi de Vargas – was likely a Spanish Jesuit who was being attacked by another man, Kaspar Schoppe, who was a German Protestant-to-Catholic convert with a sharp tongue against the Society of Jesus. Schoppe was probably a skilled debater who spoke out against Vargas, and Forer’s way (as well as the rest of the world’s way at the time) of getting even was to write a book in defense of Vargas; it is a sort of political treatise dealing with controversial religious (and political) figures at the time. Somewhere in its life the book was nearly ruined by water and rebound to be saved, oddly enough by manuscript waste that is likely religious in itself as well. As clergy changes over time, so do the liturgical needs of those clergy, and as certain medieval, liturgical manuscripts became obsolete, Forer’s text did not. Due to this salvation, the Burns’ copy is a 17th century work, bound by a 15th century work of an elaborately different style, at a time sometime likely during the 19th century. Appendix Ad Grammaticum Proteum therefore is a text that truly – physically and literary – spans the ages of book publishing. 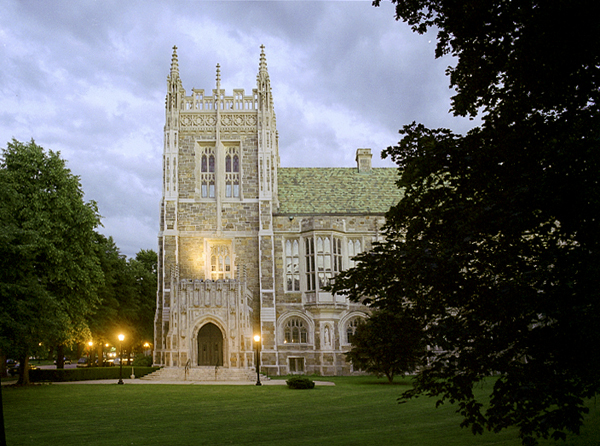 This entry was posted in Conservation, Featured Collections & Books, Staff Posts, Student Posts and tagged bookbuilders of boston, bookbuilders of boston internship, bookmaking, boston college burns bookbuilders, rare books and special collections students. Bookmark the permalink.